The Astros already look good, but this spring, the organization will get a closer look at a couple players that could contribute to an even brighter future. Houston extended non-roster invitations to Major League Spring Training camp to No. 8 overall prospect Forrest Whitley and No. 42 Yordan Alvarez, the club announced Tuesday. Whitley is considered the top pitching prospect in the game with a 6-foot-7 frame and a fastball, curveball, slider and changeup each receiving plus to plus-plus grades. The 2018 season wasn't great for the 21-year-old right-hander -- he was suspended 50 games for a drug violation and then battled lat and oblique injuries after returning to the mound with Double-A Corpus Christi in June. He posted a 3.76 ERA and 0.99 WHIP with 34 strikeouts over eight starts (26 1/3 innings) during the regular season. He also made one postseason start, lasting 2 2/3 innings in which he fanned six of the 10 San Antonio batters he faced. The Astros sent Whitley to the Arizona Fall League to add extra innings, and the 2016 first-rounder looked dominant there with a 2.42 ERA, 0.96 WHIP and 36 K's in 26 frames. Whitley will be back in the upper Minors to open 2019 and has a good chance to slot into the Houston rotation this summer. Alvarez is coming off his second, and most powerful, full season with the Astros. The 21-year-old left-handed slugger hit .293/.369/.534 with 20 homers and 21 doubles in 88 games between Corpus Christi and Triple-A Fresno. His above-average hit tool and above-average power have pushed him up prospect boards since he originally signed with the Dodgers in June 2016. However, defense remains a question for the Cuba native. He made 63 starts in left field last season and four at first base, and some believe his size will ultimately lead him to the latter position. Barring an incredibly hot spring and a Major League roster crisis in Houston, he'll open the 2019 season with Houston's new Triple-A affiliate in Round Rock. 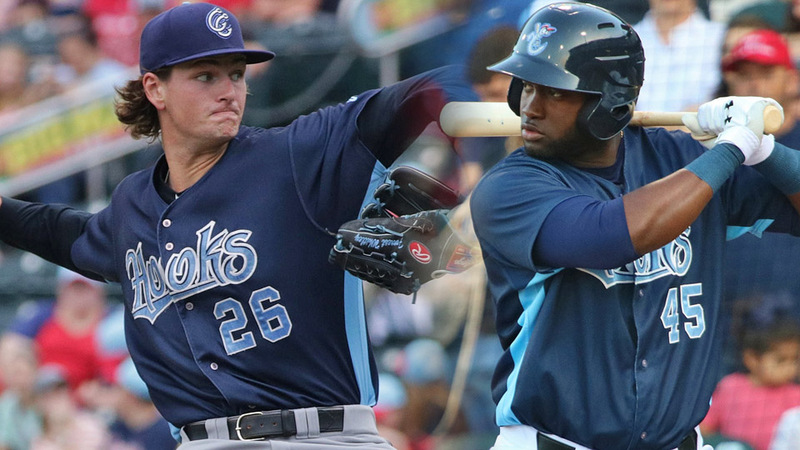 The other ranked Astros prospects to receive non-roster invites Tuesday were No. 6 Corbin Martin, No. 8 J.B. Bukauskas, No. 19 Brandon Bielak, No. 20 Ronnie Dawson and No. 23 Abraham Toro. The full list of non-roster invitees includes infielder Alex De Goti, infielder Taylor Jones, infielder Jack Mayfield, infielder Josh Rojas, infielder Nick Tanielu, catcher Lorenzo Quintana, catcher Jamie Ritchie, catcher Chuckie Robinson, left-hander Kent Emanuel, right-hander Akeem Bostick, right-hander Ryan Hartman, right-hander Jose Hernandez, right-hander Brendan McCurry, right-hander Erasmo Pinales and right-hander Cy Sneed. Sam Dykstra is a reporter for MiLB.com. Follow and interact with him on Twitter, @SamDykstraMiLB.v This story was not subject to the approval of the National Association of Professional Baseball Leagues or its clubs.